Suppose you are writing a paper and you’re trying to refer to one of your sources. You feel like you’ve already used “according to” way too much. You could go to MICUSP, the Michigan Corpus of Undergraduate Student Papers at http://micase.elicorpora.info, for inspiration. This “corpus” (a body of texts) is a searchable collection of dozens of real student papers that received a grade of “A” at the University of Michigan. Try looking up the words according to. 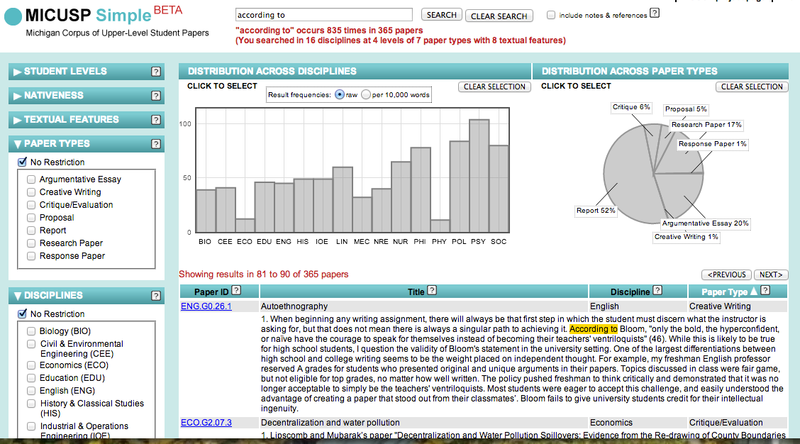 You’ll see 835 examples in 365 papers that you can explore by subject, assignment type, and more. As you browse examples, notice what other language is also used to reference sources. Beyond indicating references, what else do you notice about how “according to” is actually used? Leave a comment here: what did you find useful on/about MICUSP? Categories: Suggested Websites | Tags: academic, Academic Papers, Academic writing, corpora, corpus, english, essay, language, paper, plagiarism, references, sources, University of Michigan, writing | Permalink.